Patrick Porter - "Lisha Kill"
It's been three years since Patrick Porter's last album (Reverb Saved My Life) on Camera Obscura. But he's not exactly been laying low because at least three self released CD's have appeared in my mailbox since them. Though he's from Denver, Colorado, Lisha Kill was recorded in the east coast industrial town of Schenectady, New York, where Patrick was living with a girlfriend. I should point out that I was born and raised in Buffalo, New York, so when I hear about a songwriter experiencing an industrial city in New York state my interest is aroused.... that and the monster on the CD cover kicking a guitar across a field. 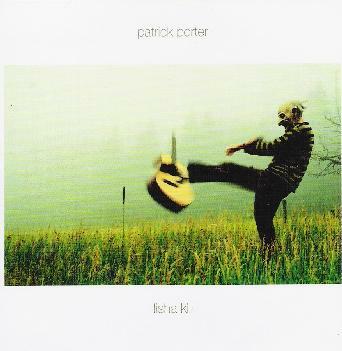 For the uninitiated, Patrick's music is based in acoustic folk-psychedelia. The music and vocals create a slow paced melancholy mood, but are by no means depressing. Patrick is a singer-songwriter at heart, but the music manages to be adventurous while never losing sight of the SONG. The songs float along like the best of 60's San Francisco psychedelia, yet easily escape the "retro" tag. I couldn't help but notice the quote from Patrick in the promo sheet saying that he considers Lisha Kill to his first album.... like the other ones were pre-season football games or soccer friendlies. I've been mightily impressed with everything I've heard from Patrick so this comment prompted me to dig in for the deep listen. Song-wise I'll let Patrick determine if this is a step beyond his previous efforts. But as someone who really digs a songsmith who can keep the focus firmly on his songs and back them with music that goes into the cosmos I'd say Patrick can confidently claim success. His melodies are soothing and seductive, and the music challenges the attentive listener, yet doesn't pressure those who just want to dig the songs. 13 songs... and absolutely gorgeous psychedelia, occasionally with a free wheeling experimental edge lurking beneath the surface. Along with the recent release by Nick Castro I'd say this is one of the best damn folk-psych albums I've heard this year. For more information you can visit the Patrick Porter web site at: http://www.nervoushalo.com. Visit the Camera Obscura web site at: http://www.cameraobscura.com.au.